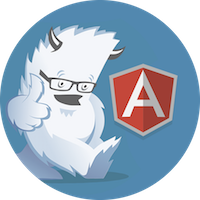 A couple weeks ago I wrote about using Foundation with AngularJS. Based on research I'd done, I concluded that it was best to use Foundation for Apps for any webapps my client created and Foundation for Sites for any websites (e.g. a WordPress-based intranet). After doing my initial research, I did some prototyping with Foundation for Apps (F4A). What I discovered is that F4A does not include all the same components as Foundation for Sites (F5). For example, the top-bar and dropdown functionality are missing. I posted my issues to the Foundation Forums. It should work. You would need to copy over all the Scss and global mixins that you used in top-bar or at least all the output CSS from it. Otherwise there is no reason the components won't fit into the grid. After making this change, the top-bar rendered and my dropdowns worked. Since there was no jQuery in the page, I thought this might be a viable option. However, Jason Demitri quickly pointed out it probably wouldn't work with mobile. He was right. While using F4A, I noticed that its components, and much of its look-n-feel, was different than F5. If you look at its Email App template, you'll see it looks kinda like a mobile app, even in a desktop browser. After trying F4A myself, I decided that F4A wasn't for us. First of all, it doesn't seem to provide a consistent look and feel with a website that's written using F5. Furthermore, F4A only supports IE10+. In the healthcare industry, there's a lot of older browsers out there, so my client needs to support IE9 as a minimum. F4A is pretty new and I imagine it'll add more of F5's features as it evolves. However, I don't know if the two will ever be so similar that they can live side-by-side and allow a seamless experience for users. If you're interested in mixing F4A and F5, you might want to watch Jason Demitri's foundationUltra. This project combines Angular Foundation, Foundation for Sites, Foundation for Apps and Font Awesome. You can see a demo at http://relutiondev.github.io/foundationUltra/. Thank you for the mention Matt. One last thing you may want to watch is if you move the apps angular directives you need to correct the path to the template location for each element.